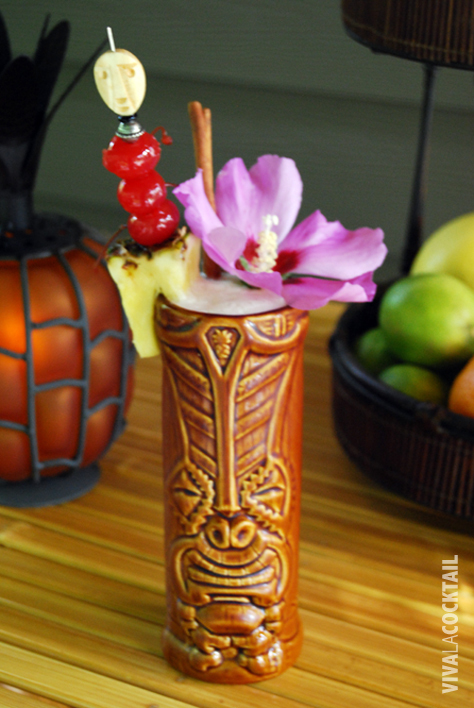 Nothing says “tiki” like a drink served in a tiki mug with an extravagant garnish. 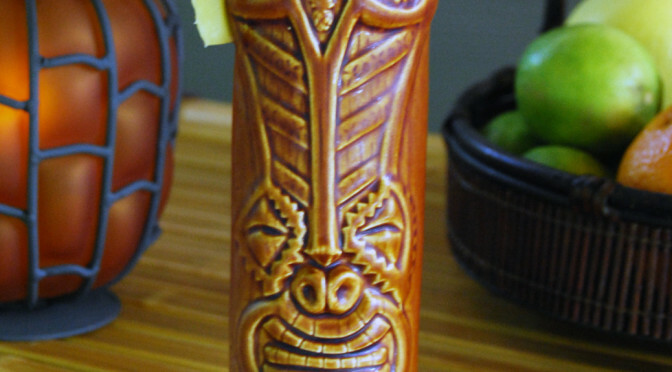 I always like to incorporate one drink served in a tiki mug into my tiki party cocktail rotation. This is your chance to go all out on the garnish—the more the better as far as I’m concerned! Because the drink is served with a straw, you can really load it up and not worry about pineapple chunks plopping out when your guest takes a sip. The Thurston Howl is a wonderful concoction ripped from the pages of Imbibe magazine (May/June-2009). It makes wonderful use of Tangueray’s Rangpur gin—which is heavy on the lime—and pairs well with the Appleton rum and the Paul Masson brandy. This is a delightful concoction to sip on a warm summer day. Plus, the name always brings a smile to people’s faces. Fill a shaker full of ice. Add the rum, brandy, gin, juices, nectar and syrups. Cap the shaker and shake vigorously for 15-20 seconds. Pour into a tiki mug. Garnish with pineapple, cherries, cinnamon stick and a hibiscus flower. Making garnishes should be fun—so take your time. You can pre-make your garnishes right before your party so that you don’t feel rushed when your making drinks. Be careful when using flowers as garnishes because you don’t want to use flowers with pesticides on them. I like to grow my own flowers for garnishes since I know that they’re not treated with anything.